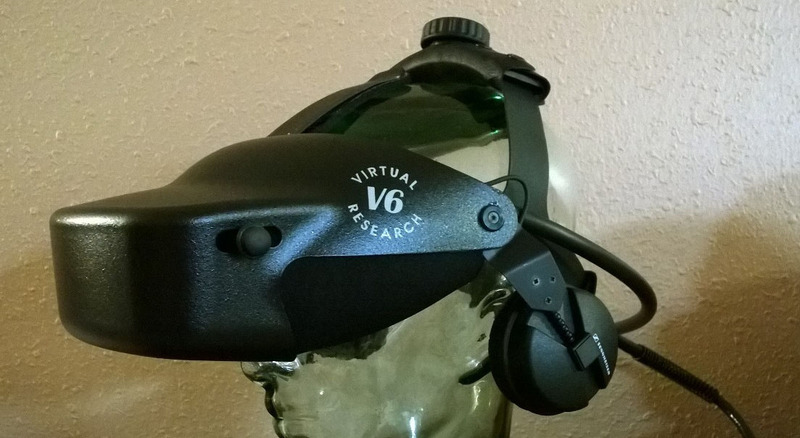 1995 brought us the V6 head mounted display from Virtual Research, the successor to the excellent design of the VR-4. The V6 doubled the overall resolution while retaining the great optics, field of view, comfort, and ease of use originally found in the VR-4. In addition to improved image quality, the V6 refined many of the mechanical elements pioneered in the VR-4, greatly simplifying these mechanical elements. The VR-4 had quite a number of circuit boards inside the helmet, but the control box could have been built completely from Radio Shack components. The V6 moved almost all the electronics into the control box, leaving the helmet with a minimum of electronics. The V6 manufacturing process did not require any expensive tooling, such as injection molds. The plastic parts are either thermoformed or milled in a machine shop. The metal parts are either stock or machine shop fabricated. Great for short and medium run products! The VR-4 used extremely thin thermoform plastic for light blocks and circuit board mounts. This plastic tended to crack and break off over time. The V6 totally eliminates this thin plastic and uses sheet metal (anodized aluminum) and milled plastic instead. The V6 was followed shortly by the V8, again doubling the resolution. The V6 and V8 share the same control box, power supply, and mechanical components. The V8 adds a small fan inside the helmet shell to cool the electronics and LCDs. The displays and driving electronics are from Epson. What’s The Deal With This Site? Who thought we’d be doing archeology on Virtual Reality? It’s been almost 25 years (maybe more…) since VR hit the media and sparked the imagination of millions. So much promised, but often not delivered. To call it a “fad” or a “craze” is far too simple. For those of us who were there, VR was a giant wave that swept over us in the late 80’s and early 90’s, and left quite a bit of wreckage behind as the tide receded. Grab Some VRtifacts For Yourself!